Media captionUS tariffs: What do we need to know? 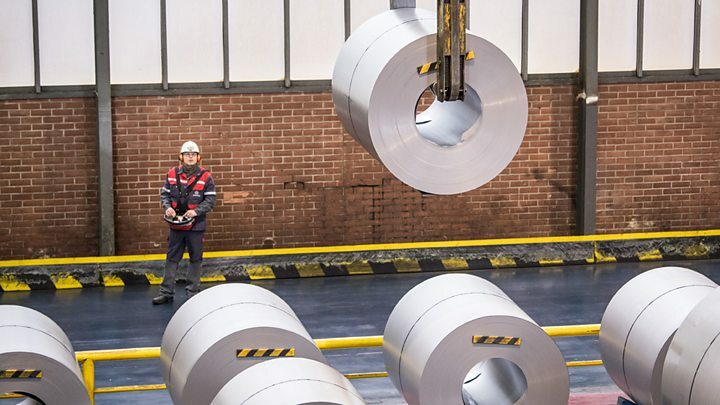 The EU's trade commissioner has said the bloc "will stand up to the bullies" over protectionism as tensions continue over US tariffs on imported steel and aluminium imposed by President Trump. Cecilia Malmström was speaking at a conference in Brussels, following discussions at the weekend with US Trade Representative Robert Lighthizer. Those talks are to resume this week. Ms Malmström said protectionism was being "used as a weapon to threaten and intimidate us". The EU says that its exports should be excluded from the measures. Mr Trump's announcement of import tariffs of 25% on steel and 10% on aluminium has sparked fears of a trade war. He signed the measures on Thursday last week in a ceremony at the White House attended by steel and aluminium workers. In another development, Mr Trump tweeted on Monday that Commerce Secretary Wilbur Ross would be speaking to EU representatives about "eliminating the large tariffs and barriers they use against the USA". "Not fair to our farmers and manufacturers," he said. Without specifically mentioning the US, Ms Malmström said: "In some places, trade has been to blame for the pains of globalisation or they used it as a scapegoat or they think we can live behind walls and borders. "Recently we have seen how it is used as a weapon to threaten and intimidate us. But we are not afraid, we will stand up to the bullies." The EU has threatened retaliatory tariffs on US goods, including iconic products such as bourbon and blue jeans. What links Trump, Lincoln and Ferris Bueller? Canada and Mexico will be exempt from the tariffs initially, and Australia is optimistic that it too will gain exemption. Mr Trump has linked this to a new security agreement between the US and Australia, which already have close military ties. UK Steel says 7% of its steel exports go to the US, worth £360m. There has been strong opposition to the tariffs from Mr Trump's fellow Republicans, who traditionally favour free trade. Mr Trump says the measures will "protect the American worker" and fulfil a campaign promise. Video What do we need to know? Too late for US steel?